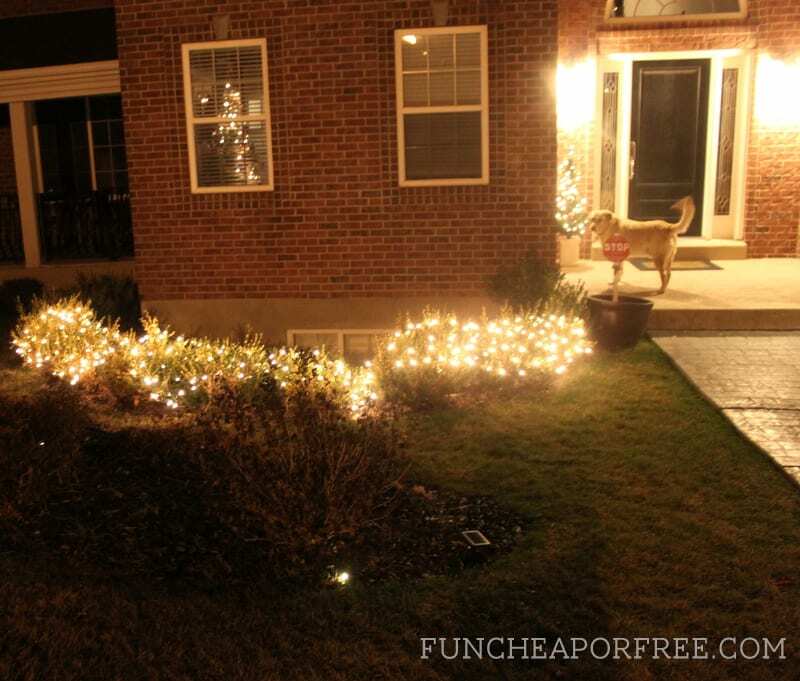 How we saved $300 on our Christmas lights + Christmas giveaway! It's no newsflash that Christmastime is an expensive time of year, and not just because of gifts!…decorations, the Christmas tree, neighbor gifts and treats (stay tuned, tons of last-minute ideas coming very soon! ), and for us especially, CHRISTMAS LIGHTS. I'm sure many of you are thinking, “uh, what's so new and great about this concept?”. My answer? NOTHING! I'm sure many of you have done this for YEARS! But for me, hanging Christmas lights was important. I wanted our house to look like the others in the neighborhood, and be as beautiful as possible around Christmastime. When we stopped and truly thought about how much those little house lights were costing us each year, we decided to strip down our pride and go simple. As you can see, we don't even have mature trees or anything in our yard. Just two simple, skinny little trees, and some small bushes. 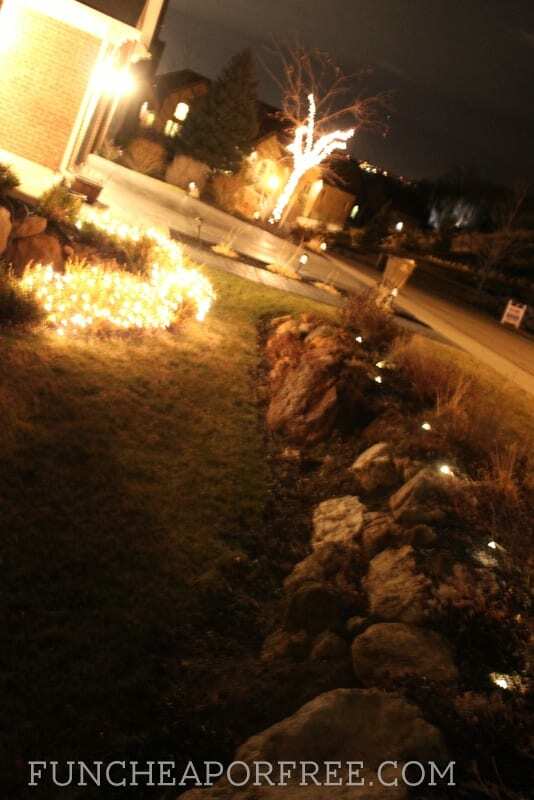 We went to Walmart and bought some inexpensive net and strand lights, strung them around the yard, and voila! 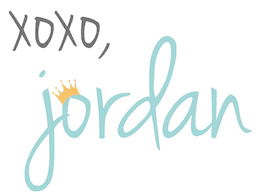 Decorated for – literally – a fraction of the cost. Yes, it's a bit sparse this year. But we didn't want to go overboard and spend a billion dollars (that would defeat the whole purpose of not hanging house lights, after all!). We plan to go after Christmas and buy great yard decorations and lights on clearance, so we can fully deck out our yard next year. Baby steps, folks! 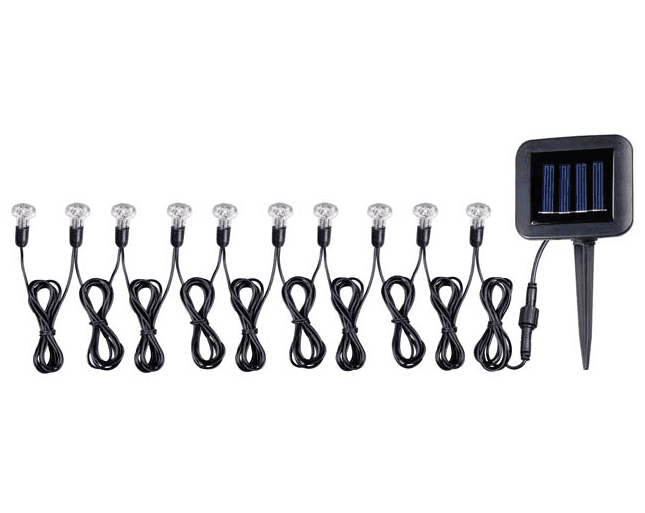 My favorite touch to the yard, though, is a really cool solar light strand from Kenroy Home. You don't even have to plug it in! 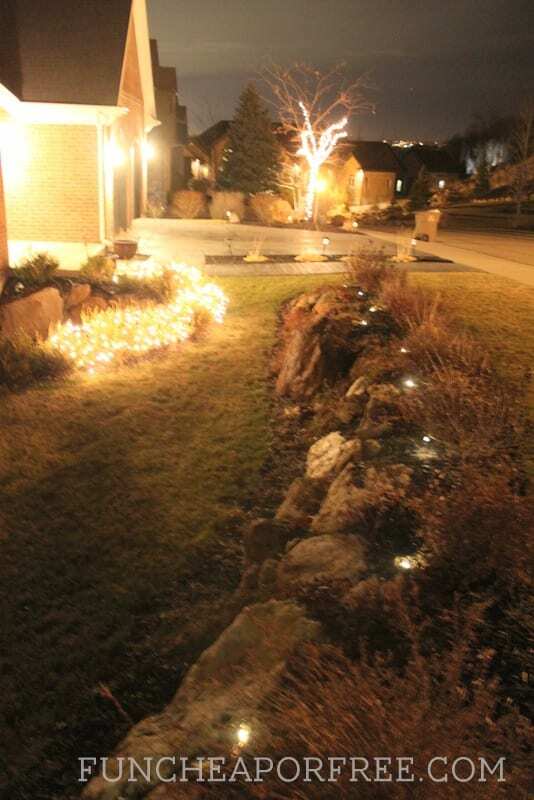 Just stick the solar panel and lights into the ground (we used them to illuminate the bushes that were too small for Christmas lights), and BAM – lights up on it's own without costing you any utilities. The pictures aren't great and the concept is simple, but that's how we saved a quick $300 this year. I urge you all to find little ways to simplify during the holidays to save YOU quick and easy money, too! Ready for a Christmas Giveaway?? I couldn't talk to you about cool lights without giving some away, right? Enter to win 1 set of solar lights ($75 value!) 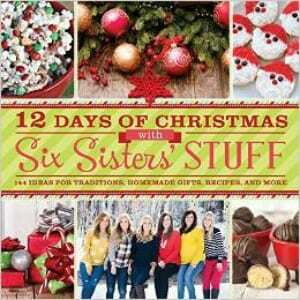 and my favorite Christmas cook book, the Six Sister's 12 Days of Christmas Cook Book ! Best of luck and Merry Christmas! where do you buy your T shirts for layering under you clothes. I have used the “downeast” brand but they are hot when you have another shirt on top. What I would like to find is a very thin, somewhat silky material blend that is light weight . Any ideas.